While you're driving, a warning light on your vehicle's instrument panel comes on. What should you do? While you're driving, a warning light on your vehicle's instrument panel comes on. What should you do? Right in front of you on your dashboard are a number of warning lights which illuminate to tell you if something is either critically wrong or could go wrong soon. In general red lights should be paid immediate attention while yellow lights tend to be advisory (although this is not always the case, depending on the manufacturer). Your manual will have a full list of warning lights for your specific car, but here are the main ones you will encounter and what you should do about them if they come on. If you or your passenger doesn’t have your seat belt fastened properly this light will show. The colour of the warning tends to depend on the car. This light means that your battery is not charging. While it won’t effect your ability to drive, the battery is now draining rather than charging which means electrical systems eventually may stop working, and you won’t be able to restart the car. If no other lights come on when this light comes on you are OK to continue a few miles until you find a garage that can help. If the light is in yellow it’s only advisory that something’s not quite right. If the engine sounds OK and you haven’t experienced a loss of power then you will be fine to continue to a garage for a short distance. If it’s red, then you should stop immediately otherwise you could cause expensive damage. If the P shows you’ve left the parking brake/hand brake on. It’s not usually powerful enough to stop you driving away, but if you do it will eventually overheat and catch fire. If it comes on when you are driving then there could be a problem with the cable. 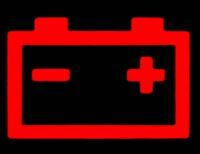 If the brake warning light with an exclamation mark comes on then you could have problems with brake fluid pressure. Stop immediately otherwise you might experience brake failure. If the oil pressure drops then you can cause serious damage to your engine’s internals. It’s best to stop immediately if this light comes on. It can be a warning that your oil is gradually leaking, or it could be that it’s leaking catastrophically quickly. If it’s the latter, you literally only have a few seconds to stop. If the ABS sensors are faulty then you might get this light. If the brakes feel fine then you should be OK to continue to a garage. However, if the brakes don’t work or are erratic, then you should stop immediately. This warning light is most likely to indicate a slow puncture as if you’ve had a blowout and a complete loss of pressure you will feel it immediately. Stop to check the tyre for something like an embedded nail. If you have puncture sealant then you can use it to block the hole. If you can’t find anything then it might just be that you haven’t pumped your tyres up for ages and they’ve gradually gone down. With a slow puncture you might be able to get another few miles to a petrol station to reinflate the tyre temporarily and continue until you can find either a tyre shop or a place which has puncture sealant. It’s best not to drive any further than necessary on the tyre, though. Once the tyre starts to lose pressure it will affect your handling and braking performance. This light could be orange or red depending on your car. Cars will usually travel at least another 20-30 miles after this light comes on, but it depends entirely on how you are driving the car and what type of terrain you’re driving it through. This website shows how long people have found they can drive their cars after the light comes on. However, it’s not good to use that last little bit of fuel in the bottom of the tank because there’s always a certain amount of sediment in there which will get sucked through into the fuel filter. It’s quite easy to not properly close one of the doors or the boot. When the door isn’t closed properly it compromises the structural integrity of the car in a crash. This light also can let you know that a passenger (e.g. a child) has opened a door. 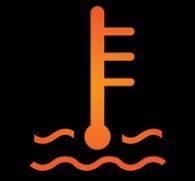 If your car is overheating you should stop immediately and let it cool down. Turn on the fan to help dissipate heat. Open the bonnet to let the engine cool. Once the engine is cool you can check the coolant. Engines don’t use up coolant so if yours is low, you’ve got a leak somewhere.